I blogged about the chempedak in Food Haven two years ago. However, I have a much more flattering photos this time so I am just going to share the photos. If you wish to read more about chempedak, please surf over to my post on chempedak in Food Haven. 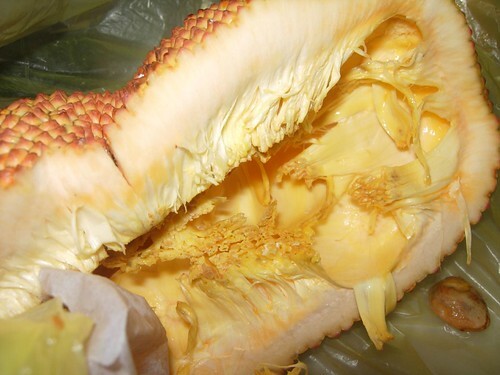 Modern agricultural technology has made the chempedak a lot more appetising. The flesh is thicker, juicier, sweeter and sometimes, the seed is very tiny too. We just need to make a slit at the top and tear the skin apart. Then, we managed to pull the middle stem and all the fruits came off nicely. 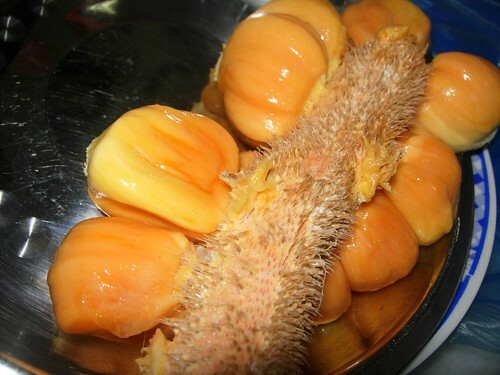 One of the reader from another country commented that the fruit looks like an alien! Well, chempedak not only looks ugly on the outside, it has a very strong smell as well. But I love it. Both fresh and cooked as fritters. I don’t like the fresh fruit.. but fried… mmm… yummy! Dang those rubbery stains on our fingers! i will say i like it. also the fried one. I love the fried one… I can never ever say no to fried cempedak…. I don’t care if chempedak looks like an alien, I love chempedak, either eat them raw or goreng chempedak. The thing is I only could get frozen chempedak imported from Vietnam. Ehhh… this cempedak looks a bit different from the kampung cempedak I see here. 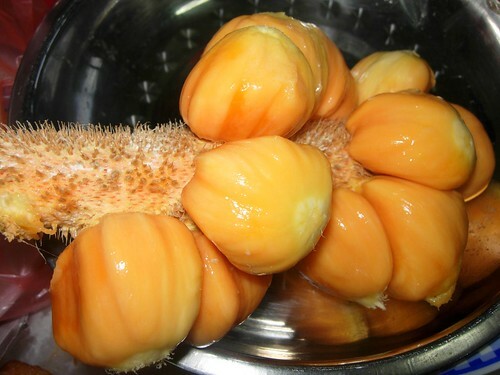 Yours look like a cross between a cempedak and nangka, eh? Amazing.